We are in the process of developing and expanding our world wide reseller network. If you are interested in joining our network, please visit contact page. Imagine a world with faded colors. You may already be experiencing vision in a world where some colors are confusing. 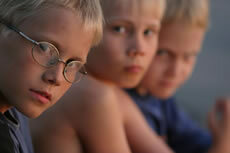 Although there is no cure, there is a solution - ColorView® lenses. Some complimentary colors might be difficult to distinguish for some people. These symptoms may be caused by congenital red-green color vision deficiency, and now there is a solution. ColorView®spectacle lenses help people with congenital red-green color deficiency to distinguish colors easier and reduce color confusion. ColorView® lenses may be right for you! To discover the difference they can make, contact one of our Optometrists who will help determine, from testing, the most appropriate lens for you. ColorView® is launched on Seattle, WA. area! ColorView® is launched on Western Florida area! Contact to us to find out your local ColorView® partner.